Information graphics | eBeam Rocks! OK- so I know I’ve been posting quite a few infographics lately, but I’ve just been finding some really cool ones that give all kinds of information about technology in education today. I’ve been known to not have the longest attention span, so I think sometimes instead of reading a lengthy article, I just prefer looking at an infographic that is full of thought-provoking statistics. Call me lazy. Anyway, check out the infographic below. It takes a look at technology for students, used both in and out of school, from the points of view of the students, the parents, and even the administrators. 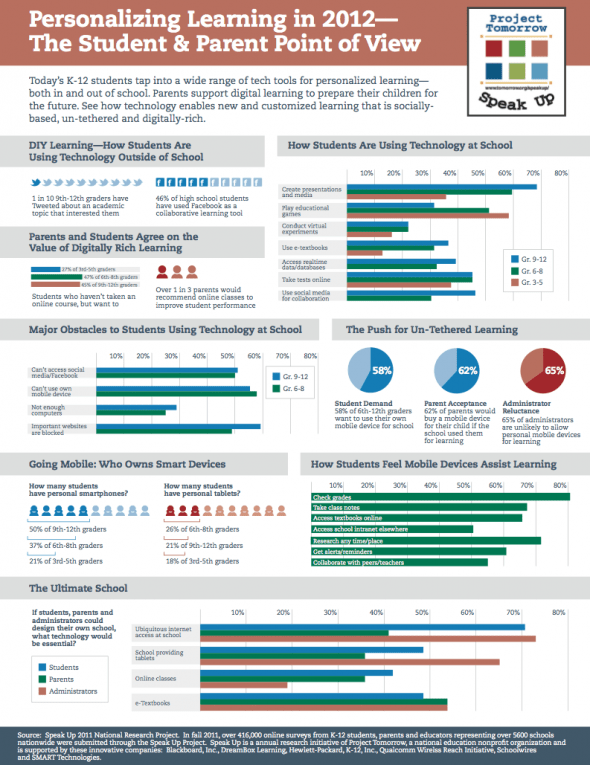 This infographic was found at http://www.tomorrow.org/speakup/2012_PersonalizedLearning.html.